Tallahassee Leadership Academy (one-year comprehensive program) for professionals that includes a full year (12 progam months) of leadership curriculum, mentoring, coaching, assessments, and evaluation. 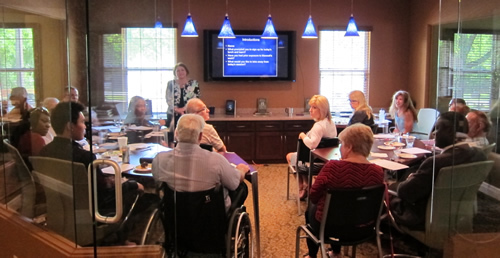 Class size is limited to 12 participants for a group coaching environment. Apply today to join the 2016 Leadership Academy and receive bonuses for early registration! Check out the Leadership Academy schedule for details of the current year's curriculum. For more information, contact Dr. Gabrielle K. Gabrielli at 850-321-8222 or via email at gabrielle@gabrielleconsulting.com. Gabrielle Consulting's Leadership Development Center in Tallahassee features beautiful new offices and a state-of-the-art conference room. Plugged In Leadership is branch of Gabrielle Consulting, Inc. Registration is now open for the Tallahassee Leadership Academy (one-year comprehensive program) for professionals that includes a full year (12 progam months) of leadership curriculum, mentoring, coaching, assessments, and evaluation. Class size is limited to 12 participants for a group coaching environment. Apply today to join the 2016 Leadership Academy and receive bonuses for early registration! Vote for the 2015 Leader of the Year among excellent finalists! Voting closes on 1 October. The Leadership Academy of North Florida is a partnership of Gabrielle Consulting and Tallahassee Community College. The winner will be announced at the December awards ceremony. In December 2014, the Leadership Academy of North Florida, located in Tallahassee, Florida, celebrated the end of its first successful year. The deadline is approaching to apply to join the 2015 Leadership Academy! The first session is 17 February. Check out the Leadership Academy schedule for details. For more information, contact Dr. Gabrielle K. Gabrielli at 850-321-8222 or via email at gabrielle@gabrielleconsulting.com. Gabrielle Consulting, in partnership with Tallahassee Community College, celebrated the end of the inaugural year of the Leadership Academy of North Florida. Leader of the Year was awarded to Amber R. Tynan, and Emerging Leader of the Year was awarded to Patricia B. McCray. Today's graduation ceremony celebrated the end of a highly successful year. Apply to join the 2015 Leadership Academy today! What do you need to become? What do you need to refine the leader within you? What do you need to develop your leadership skills, goals and aspirations? Your leadership abilities and talents can be taken to the next level — even beyond — with the unprecedented and innovative leadership training, mentoring, and coaching developed at the Leadership Academy of North Florida, a partnership of Tallahassee Community College and Gabrielle Consulting, Inc.
Enrollment is now open for the second year of the 12-month program that begins January 2015. The curricula includes leadership topics from communication, human resource techniques and servant leadership to problem solving, critical thinking, creativity, conflict resolution, emotional intelligence, and building a legacy by developing others. 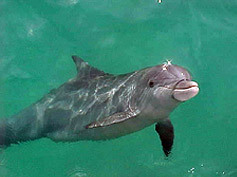 Many of the topics are based on the teachings of leadership guru John C. Maxwell. Academy founder Dr. Gabrielle K. Gabrielli is a Certified Maxwell coach, speaker, and trainer. “What makes the Leadership Academy unique is the fact that the curriculum is customized for emerging and seasoned leaders, and we use coaching and mentoring to help leaders be even more successful in clarifying and achieving their goals,” said Gabrielli, who developed the curriculum and teaches the classes. “I enjoy watching people’s professional and personal lives transform to phenomenal levels as a result." Amber Tynan, Director, Development and Communication, Elder Care Services, Inc. states, “I was looking for a program that would help me strengthen and share my strongest abilities as a leader, while developing the areas that I struggle with (i.e. confrontation).” Tynan said she was surprised with the caliber of leaders in the class and the knowledge they shared with each other. The program addresses two types of leaders: 1. Emerging leaders who are young professionals, career changers, or those seeking leadership roles, and 2. Seasoned leaders who are executives, supervisors, or those seeking to leave a legacy of leadership and influence. This year’s class is diverse, creative, and multi-generational, the makings of an interesting mix of leadership thought and process. The inaugural class graduates this December and the new class begins monthly programs January 2015. Total investment for emerging leaders is $1,998 and for seasoned leaders is $2,398. The program takes a systematic approach to leadership development training by providing rigorous curriculum, assessments, coaching, mentoring, and evaluation. The selection process for the inaugural class contiues through 20 December 2013, and the first group of leaders will begin January 2014. The program takes a systematic approach to leadership development by providing rigorous curriculum, assessments, coaching, mentoring, and formative and summative evaluation. In addition to classroom-based instruction, leaders will remain connected via technology including a website portal, discussion forum, and monthly mentoring teleconferences. Investment in the yearlong comprehensive is $1998 for emerging leaders and $2398 for seasoned leaders. The leadership development program will enhance leaders’ skills and directly benefit their influence on others, in turn positively impacting the bottom lines of organizations they serve. It will provide meaningful resources and tools leaders will take back to their workplaces to shape their careers, innovate within their organizations, and be active participants engaging in meaningful transformation individually, professionally, community-wide, and beyond. The curriculum includes leadership topics ranging from communication to problem solving, critical thinking, creativity, conflict resolution, emotional intelligence, and building a legacy by developing others. 26 April 2013- Wow! What an amazing year so far. Dr. Gabrielle K. Gabrielli developed Plugged In Leadership, a think tank for leaders to further expand their potential. We have a beautiful, new office and conference room at our Leadership Development Center located at 3035 Eliza Road where we offer leadership courses, lunch and learn seminars, teambuilding, and strategic planning retreats. 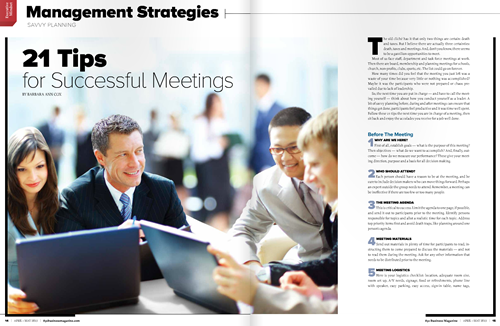 April - May Read Barbara Ann Cox, CMP's excellent article in 850 Magazine on Management Strategies: 21 Steps for Successful Meetings. Her Savvy Planning article begins on page 14! 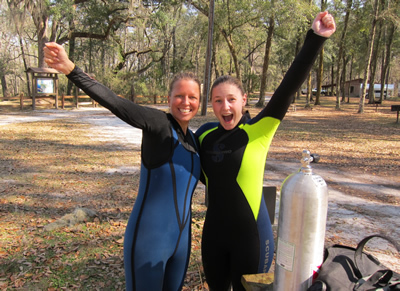 20 April 2013- What does SCUBA diving have to do with human performance improvement? Everything! 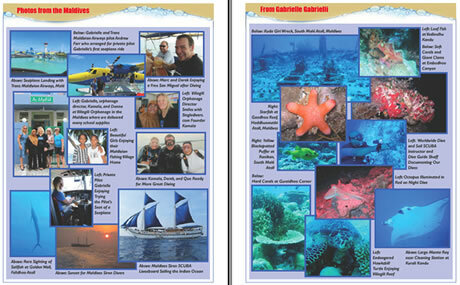 Gabrielle Consulting has another side to the business called SCUBA with Gabrielle. Gabrielle has three instructor certifications including SCUBA Educators International - SEI (used to be YMCA), Confédération Mondiale des Activités Subaquatiques - CMAS, and Handicapped SCUBA Association - HSA. In April 2013, Currents, a journal for SCUBA professionals, published Gabrielle's article and pictures about her recent Magical Maldives SCUBA liveaboard experience. Download the journal and check out pages 4-9!